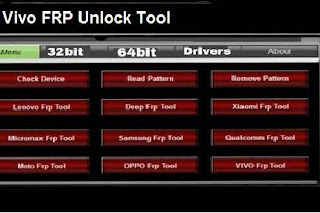 Vivo FRP Unlock Tool latest version is recently released for all Vivo users. This latest tool allows you to unlock Vivo mobile phone and Bypass Vivo smartphone FRP within few seconds. This latest Vivo FRP Unlock tool easily unlock google account in vivo smartphone in a minute without pay of any cost. If you wish to Bypass your device FRP account lock protection without flashing, then this latest Vivo FRP tool is the best option for you. With the use of this tool, you can easily unlock all Vivo Android smartphone locks in few clicks for free. Unlock all Vivo smartphones FRP Lock within few clicks. Remove any Vivo mobile phone FRP Lock within seconds. Remove smartphone other Locks Like Pattern locks, Phone locks, and IMEI locks. Clear interface for Vivo users. Here we share some simple and easy steps to download and install latest Vivo FRP unlock tool. just follow the instructions and remove Vivo FRP lock within seconds. Download Vivo FRP unlocks tool from given download link. After download file is complete simply run setup to install it on your computer. The installation process will start, just follow the screen instructions. Now connect the Vivo FRP locked device to the computer and open Vivo FRP Tool. You will see the home screen of Vivo FRP tool. Now connect the device and click on the remove FRP lock button. Within few seconds the tool will bypass the FRP lock and will not ask any Goole account information or password. Done, Now use your Vivo phone. If you connect the Vivo smartphone to the PC for unlocking FRP lock. you need to make it sure the right USB drivers have been installed on the computer. Without proper drivers, the computer will not recognize the device and you will not get the job done. This latest Vivo FRP tool is compatible with all windows like Windows XP,7,8,8.1 and Windows 10. So download and install this latest tool on PC windows for unlocking Vivo mobile phones for free. If you looking for download latest Vivo FRP unlock tool, then click the given download link for free download. Just tap the link and your Vivo FRP tool download start within few seconds.